Antza2, those are certainly some nice views. But how does that relate to the topic of this thread? Im in love with the Appalachian mountains, especially around here in Virginia. I intend to hike(backpack) the full 2100 miles of the Appalachian Trail sometime, maybe even next year. They are around 500 million years old and are heavily eroded. They used to be as massive as the himalayas and smack in the middle of that grand ol super-continent Pangaea(created by its formation). There are also parts that related to the mountains in Europe that used to be part of the same chain. Picture i took atop a massive rock. How can people take this seriously, even though the failures in logic are so apparent? I know. And people still believe that stuff. Quite so. I have seen the beginning of that video many times but never sat through the whole thing until now. I really wish I hadn't. This is my own view, but the part where he compares the Earth to all the other celestial bodies and then uses that to support his religious view is kinda funny. In reality that contradicts religion by showing Earth is not the center and is in fact completely unimportant in any way besides to those few galactic microbes who live on it. This is my own view, but the part where he compares the Earth to all the other celestial bodies and then uses that to support his religious view is kinda funny. I was thinking the same thing. If anything, the insignificance of the Earth (size-wise) compared to the rest of the cosmos makes the biblical creation seem less credible, not more. To acknowledge the vastness of the universe and the existence of the countless number of other worlds in it, and then to still believe that it was all created for the Jews, is absurd to the eleventh power. To acknowledge the vastness of the universe and the existence of the countless number of other worlds in it, and then to still believe that it was all created for the Jews, is absurd to the eleventh power. 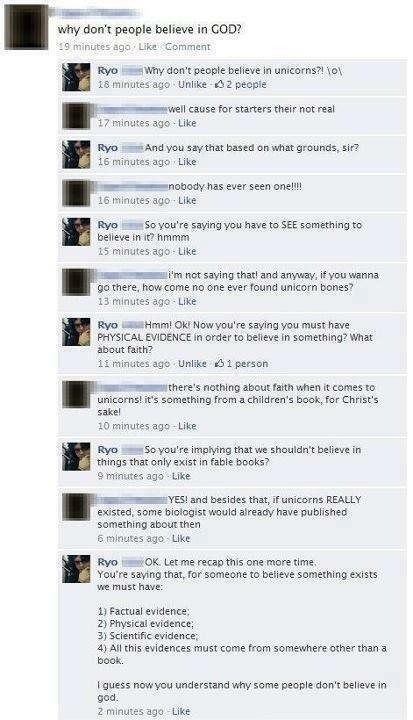 I did find the part about "atheist's believe everything came from nothing" also a bit funny. That was hilarious. Did Mr. Blurred out (whoever it was) reply anymore after this? That video with Lawrence Krauss is so full of inappropriate camera effects- what first grader edited that video? Either should do fine as both are really interesting. W. T. F. Did i just watch? I love Dawkins' documentaries! I wish he would do more.